The place for Genghis Grill menu prices. Genghis Grill is an Asian-American restaurant that is a leader in a variety of build-your-own stir-fry and treats, including teriyaki chicken, citrus beef as well as build your own bowls and meals. Guests select fresh ingredients from over 80 choices. Famous Grill Masters then take the ingredients and stir-fry them on a sizzling grill. Aside from building your own bowl, you can also choose from a selection of signature Asian dishes. Be sure to conquer your thirst by trying one of the custom handcrafted cocktails. Below are the latest Genghis Grill menu prices. What’s New at Genghis Grill? You don’t have to compromise taste to eat healthily. Genghis Grill makes it possible to enjoy a tasty meal without busting the calorie count. Check out their HeartHealthy menu options that offer great tasting dishes all under 600 calories. A complete nutritional guide is available, online, for all the ingredients. Know before you head over to the nearest Genghis Grill. Too busy conquering new lands to stop by and get a meal? No worries. With the new Genghis Grill online ordering option, you can quickly place your order and pick it up. Go online to the Genghis Grill official website and confirm that your location offers the online ordering option. Pick your favorite dishes and select your pick up time. Make every visit to Genghis Grill count by joining the Khan’s Rewards loyalty program. Every dollar you spend earns points. Accumulate points and earn free stuff, like desserts or cash. See loyalty program details online. Sign up is free and quick. By being a Khan’s Rewards member you will receive special offers throughout the year, the latest news and a reward on your birthday. Stand out from the crowd with Genghis Grill gear. From t-shirts, caps, or bowls, get your GG gear now! You can purchase any item online at the Genghis Grill website. Are you ready to conquer your career? Get ready to take your career to new heights. Genghis Grill provides new recruits with a training program, opportunity to grow plus competitive pay and benefits package. Head over to the Career page on the official Genghis Grill website. The Genghis Grill concept was started by Jeff Sinelli, an entrepreneur based in Dallas, in 1998. In 2003, Sinelli sold the 11-unit chain to 4 recent college graduates. Today, there are over 100 Genghis Grill locations in the U.S. 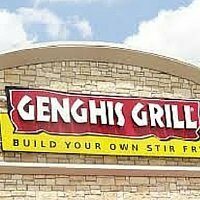 The Genghis Grill concept is owned by The Chalak Group and is based in Dallas, Texas. Stay connected with Genghis Grill through social media. For more information about Genghis Grill, visit their official website.